Choose your container or location. Decide where to place the fairy garden. Hollowed-out tree stumps are both contained and outdoors, and kids may feel like the fairies inhabited this neglected area of the yard and made it their own. 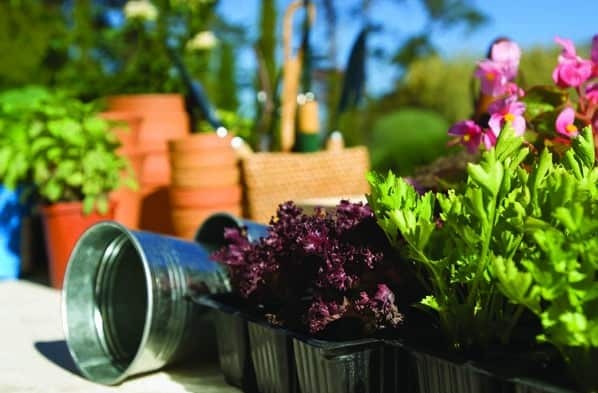 Otherwise, use containers you already have, such as old pots, hanging baskets, picnic baskets or cookie tins. Wooden birdhouses with their roofs removed also can make for clever places to house the gardens. Choose a theme. Fairy houses can take on any theme their creators prefer. Themes help children decide what to include in their gardens. For example, a seaside retreat may work well with little reclining chairs, sea grasses and succulents. You can then complete the theme by adding some seashells and colored stones. Draw up your design. Before securing anything in the container or digging into your garden bed, sketch out a garden design. This gives you an idea of how the finished product will look. Even before planting, gently place plants and other components in their spots and move them around accordingly until you find the desired look. Include similar-needs plants. Mixing plants that have different requirements can make it challenging to care for the fairy garden, so select plants that require similar levels of sunlight, prefer similar soil conditions and require roughly the same amount of watering. Herbs are a smart choice because they stay small and are easily maintained. Don’t forget a fairy dwelling. You will need to add a house for the fairies to inhabit. Small bird houses can work, but you also can consider old teapots, bird-nesting boxes or even homemade houses assembled out of bark and twigs. Use your imagination and the garden will take on a life of its own. Invite the fairies. Children can invite fairies to take up residence (fairies often show up at night and tend to remain unseen), or children can create their own fairies using craft materials.